Next: COULD WRENCH FIGHTING SAVE MONTREAL’S NIGHTLIFE? A mysterious kayak full of crystal meth was discovered on the shore of Cap Saint Jacques over the weekend, and police are baffled by it. “Last month, police in Florida discovered a motorized surfboard full of cocaine,” says Sgt. Jake Morgan of the Montreal Police Force. “That makes sense, it’s a cheap way for people to smuggle cocaine into America. The kayak that we discovered wasn’t motorized. 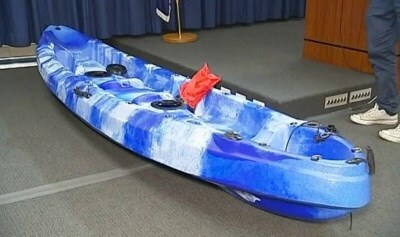 It was just full of crystal meth, like there was a lot of it, the kayak was simply overflowing with the stuff. It would have made Walter White salivate, that’s how much crystal was in that kayak." Many Cap Saint Jacques citizens have their own theories about where the crystal meth came from. “I believe it was an offering to nearby wood spirits ,” says pagan hippie and crystal meth enthusiast Sparkles Betterglow. “The Cap is sick with capitalism, and only an offering of a kayak full of crystal meth will heal its sickness. There’s a good samaritan out there, possibly a pagan chemist, who as trying to make the world a better place by feeding it with meth." Other people have less outlandish theories. “I think someone in the West Island broke bad, but then had a change of heart,” says school teacher Tanaka Mori. “They couldn’t go through with becoming meth dealers, so they abandoned their narcotics in the woods, the same way a mother might abandon her newly born child on the door steps of a church or an orphanage."